If we had an inkstand with ink and spilt the ink onto an empty piece of paper, no meaningful page would appear. In that case, we can say, “The meaning on this page disaffirms and chases off the ink’s claims of being the scribe because this would show the meaning on the page and the ink possessing freewill, strength, and knowledge. The ink does not have these qualities; therefore, it cannot be this page’s scribe.” If the entire world were to gather, they would still be unable to convince us that the word and sentences on this page, both of which signify meaning, appeared by coincidence. Is the universe not a kind of meaningful book, too? How can one believe that this meaningful book came into existence through will-less and powerless reasons that are without knowledge through the ink’s influence? Let us sit a monkey in front of a typewriter. The monkey randomly touches the keys on the typewriter. Is it possible that a meaningful word could form as a result of this random pounding? How about a sentence, page, or a meaningful book? Such a book would have meanings that are a book’s worth on each page, meanings in a sentence that are about a page-length, meanings in a word that are a sentence worth, and a central point that has gathered the book’s entire meaning. Is it possible for this kind of a miraculous book to result from the random pushing of keys? Definitely not! Is the universe not a miraculous book like that? The world is a chapter of that book, and the seas, mountains, and the terrain are a page. Every species, for example, a tree species, is a sentence. An individual of that species, for example, a fig tree, is a word in this book. The seed of the fig tree is a dot. This dot is such a mark that a huge fig tree has been written in it. In fact, this seed is a small dot that makes the divine names, which have been written in the book of the universe, visible. Like the monkey’s influence in our example, is it possible for this miraculous book to have come into existence by dumb, blind, lifeless, and unconscious causes? Of course not! Now let us look at a true library, the library of a cell! There are billions of DNA molecules in one cell. The colors of eyes, fingerprints, a person’s voice, hair structure, and all data have been encoded in these DNA molecules. Each of these DNA molecules that are found in one cell resembles a giant encyclopedia containing 46 volumes, all of which contain 20,000 pages, and does actually contain this much of knowledge. A person has approximately 60 trillion cells. If the world’s greatest encyclopedia, the Britannica, which contains 40,000 pages, is considered, then the enormity of knowledge that a single DNA molecule carries will be better understood. The knowledge that is 25 times greater than the knowledge of the world’s biggest encyclopedia has been placed into a cell’s DNA molecules that can only be seen after being magnified hundreds of times under a microscope. Is it possible that such a brilliant work could have been an act of coincidence? If the entire world were to gather to try and convince us that the Encyclopedia Britannica came into existence through coincidence, then would we believe them? They would not never be able to convince us! 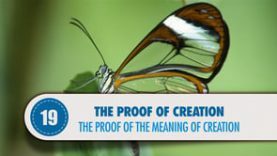 Then how can we believe that DNA, which is hundreds of times more sophisticated than the aforementioned encyclopedia, has come into existence through causes or coincidental results? We want to add this fact as well: The DNA molecules of a person’s body have been fitted into tiny cells by means of folding. The length of a whole DNA string in a person’s cell is 2 meters. If we solved every DNA that is in our cells and aligned them lengthwise one after another, the total length would be 120 billion kilometers, which is 800 times the distance between the Earth and the Sun. Do not forget that the distance between the Sun and Earth is 150 million kilometers! Could these be results of coincidence? While the DNA in a single cell cannot be explained as coincidence, shame on the one who accepts the blind notion that man has existed as a result of coincidence!